I don't know about you, but when it gets super hot outside, I don't get that excited about cooking. I'm usually just ready to eat a smoothie and some peanut butter toast for dinner most nights! 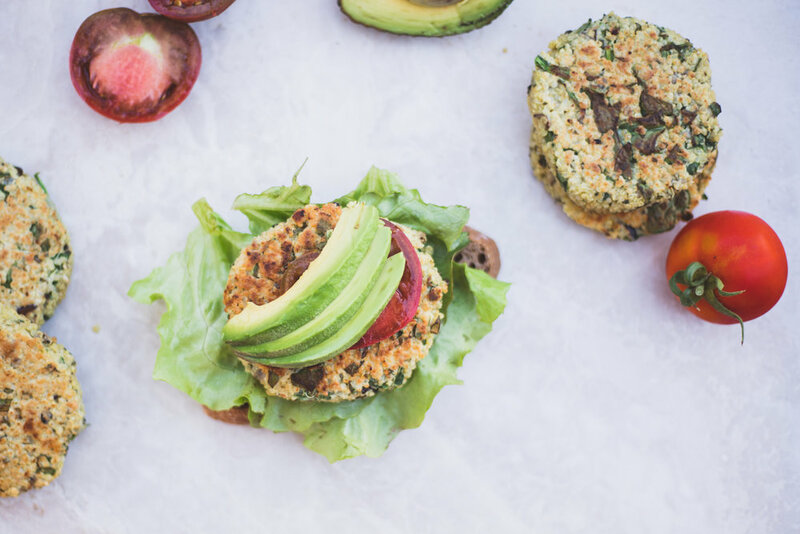 One thing that saves me from standing in a hot kitchen is these absolutely amazing veggie patties. They taste like a pesto yum bowl in veggie burger form. So full of flavor, packed with protein, and so versatile. When I make them, I just make a TON and eat them a bunch of different ways throughout the week. I eat them cold, hot, on a piece of toast, with a fried egg and avocado on top, or on a salad. So essentially the options for these delicious things are endless. It's amazing to have a ready-to-eat option in the fridge at all times. You also don't need anything to make them but a knife, a fork, a bowl, and a basic pan. Since I'm living in my van most of the summer that makes this recipe the DREAM. I hope you make these, and please tell me what you think! 1. Cook 1 cup dry quinoa in chicken or vegetable broth. 2. While the quinoa is cooking, chop the basil and spinach. In a large bowl, mash up the chickpeas with a fork (or process in a food processor) till there are no more solid chickpeas left. It should look like a thick, chunky hummus. 3. Add the cooked quinoa, eggs, feta or goat cheese, chopped basil & spinach, lemon juice, garlic, salt, and pepper to the bowl. Set aside in the fridge until ready to cook.